Dypsis cabadae (H.E.Moore) Beentje & J.Dransf. 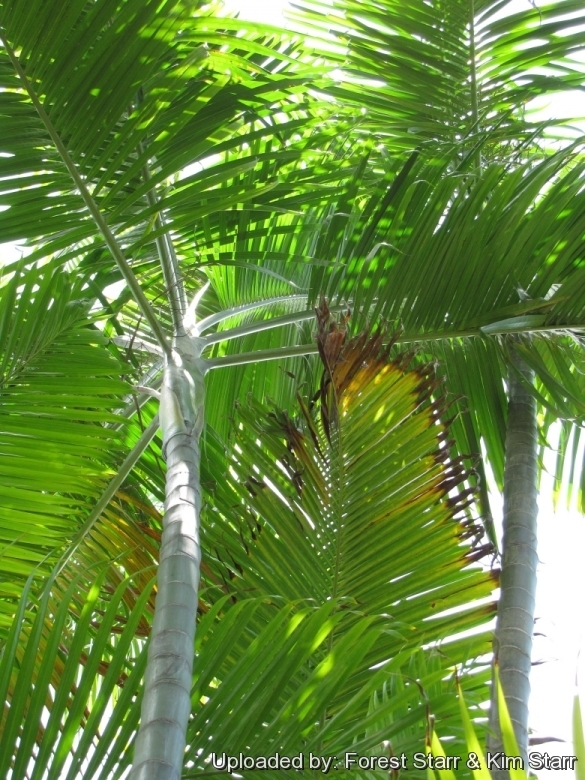 Origin and Habitat: Dypsis cabadae was described from palms cultivated in the Caribbean (Cuba) and believed to have originated in Madagascar. Untill recently, this palm was unknown in the wild. It has now been rediscovered in the Comoros Islands near Madagascar. Habitat and ecology: Open rain forest in the Comores Islands. Description: The Cabada palm (Dypsis cabadae) is a fast-growing medium sized palm to 8(-10) m tall that forms a graceful, sparse crown of arching feathery foliage, often with a bluish/grey crownshaft and a very attractive multi-bamboo trunk, but unfortunately is seldom seen in cultivation. It is very similar to the Golden Cane Palm (Dypsis lutescens) but it is larger with exaggerated characteristics and lacks the gold colour of the latter. This makes a very attractive architectural accent in a landscape. As a seedling, Dypsis cabadae are exceptionally colourful, having deep green leaves and a chocolate stem, with a hint of maroon here an there. 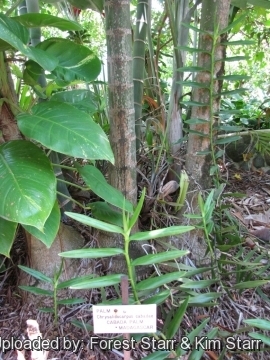 Habit: It is a classical ringed trunk Dypsis, clustering and suckering from the base in tufts of up to 14 stems, with each stem holding 6 to 10 deep green leaves. Trunks: Slender, with swollen base, to 10 m tall, to 9 cm in diameter long smooth, glossy, blueish green with prominent whitish grey rings similar to bamboo. Internodes 9-12.7 cm apart with prominent, pale nodal scars. Crown sheath: 50-75 cm long, mostly grey green with a glaucous bloom but showing a spectrum of colours from grey green to green to yellow green, and in young specimens highlighted in orange, red and bronze. Leaves: Pinnately shaped, leathery, glossy green, arranged in vertical rows 2.4-3 m in length. Petioles short 25-33 cm long (-60 cm in young shoots) with a prominent callus pad at the base, glabrous and channelled. Rachis to 1.7 m long, slightly keeled with 24-60 leaflets on each side of the rachis. Leaflets dark green, shiny up to 60 cm long, those on opposite sides of the rachis ranging anywhere from an angle of 45° to 120° with each other. Midrib and marginal veins prominent, apices acute. Although the cabada palm's leaves arch like those of the areca palm, they are held a bit more stiffly to the trunk, giving the cabada palm a very stately and majestic appearance. Inflorescence: Interfoliar heavily branched to 3 orders up to 1.5 m long, erect, green: peduncle 59-69 cm long. Prophyll green or glaucous, 44-52 cm long, 3.7-5 cm wide. Flowers yellow. Fruits: Mature fruit is scarlet red 1 cm long and are not a skin irritant as are some palm fruits. 1) Forest & Kim Starr Dypsis cabadae (Cabada palm). Plants of Hawaii. <http://www.starrenvironmental.com>. Downloaded on 21 August 2014. Cultivation and Propagation: Dypsis cabadae is an excellent garden plant adapt to tropical or subtropical. Growth rate: This beautiful palm is large and relatively fast growing for a palm, although slower growing than the Golden Cane Palm (Dypsis lutescens). Soil: Cabada palm is adaptable to a wide range of soils and fertility, but prefers well-drained sandy soil except those that are constantly soggy. Light: Prefers full sun but will take some shade. Drought tolerance: Moderate. This palm a will tolerate occasional dryness if not prolonged and can even thrives in poor, dry soils, but do better when grown in nutrient-rich soils with regular watering. Hardiness: No cold tolerance. (USDA Zones 10b – 11). It is really a palm for the tropics and it can be difficult to get it to look its best without a great amount of heat and sun. Remarks: The plant does not transplant well, having very sensitive roots that tend to die off if manipulated. If home-grown, give some sun as with most tropical palms, and water well and feed once monthly. Use: The cabada palm is an excellent accent palm for a patio, walkway or group planting to show off its unique ringed trunk as well as its foliage. It is also perfect near highways and used to accent residential landscapes and close to swimming pools. Young plants often have reddish bronze leaf stems that sound an especially tropical note. Disease & Pests: It is quite resistant to pests but may require regular fertilization to prevent yellowing caused by potassium deficiencies. Propagation: Cabada palm is propagated either by removing the suckers that develop at the base, or by fresh seeds that germinate within 1 to 4 months of being planted and the seedlings are attractive.